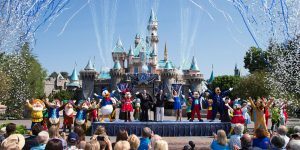 In April my daughter and I and my 2 year old grandson flew to Orange County airport for a quick weekend in Mickey Mouse land. We stayed in the Anabella Hotel, very nice, reasonable and a 15 minute walk to the park. They gave us a family room with a double bed and a separate small bedroom for me which worked out perfectly. We highly recommend the hotel for families. April 23 marked the opening date of the new Denver Train to the Plane and everyone got free rides that weekend. It was a huge party event with many families lined up at Union Station by early morning to enjoy the trip to DIA airport. The trip takes 35 minutes from downtown to DIA airport and trains leave every 10-15 minutes during busy hours, less often in the off hours. There are several brief stops along the way and each station had its own booths and party atmosphere on opening weekend. Trains are fast, smooth, comfortable, ample room for luggage and bikes and the big picture windows make for nice viewing along the way. The boarding platform is adjacent to the new, beautiful Westin Hotel, which is next to the airline terminal. Part of the terminal building was upgraded to include rustic moving art pieces and an outdoor miniature golf game. Try it on your next trip to Denver! You’ll be hooked! Kiosks to buy tickets are located on the train platform. This delightful historic steam engine train ride is only 45 minutes from Denver, and is based in the quaint and charming mountain town of Georgetown. The train ride, appropriate for all ages, is a little over an hour long. Depending on the age of your child, you can extend the tour by visiting one or more of the mines along the ride, which I highly recommend doing. The train is an open or closed car depending upon the weather. We visited on Mother’s Day and all mommies were given a single red rose and a small box of candy by the train personnel, which was very sweet! After the train tour, we visited the excellent train museum on premise and then had lunch and strolled around the historic town. Happy Cooker is a good place for lunch, moderate prices, good comfort food. If you take this tour other than summer, bring warm clothing for the morning train departures. In mid May we flew to San Francisco on an early morning flight, picked up our rental car and drove 5 hours to Yosemite National Park. Thanks to our early start, the traffic was not bad along the crowded metro area and once you head inland, it lightens up even further. There are cute little grocery stores along the way that offer refreshments and clean bathrooms. We had booked the trip 10 months ahead, but even then the lodges in Yosemite Village were sold out so we booked Wawona Lodge, now called the Big Tree Lodge. This well maintained historic hotel is a series of separate building nestled in a forest. The main building has a nice restaurant, huge wrap around porch, and a cozy lobby with fireplace and , on weekends, a little piano music. A perfect place to meet and make new friends. Book early to secure a room with private bath as many rooms are shared bath. The windy and scenic drive to Yosemite Village can take 30-45 minutes depending on traffic and the time you leave. We were prepared for crowds, even before Memorial Day weekend, but we were astonished by crush of people lined up to get on the shuttles by late afternoon. Best to start your day early to avoid the crowds, as we did. 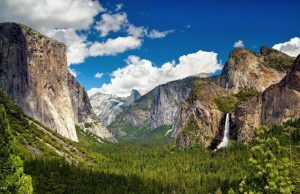 There were many Japanese tourist group, due to the fact that Yosemite is a sister park to one of their national parks. We enjoyed many hikes, including an all day walk through the meadow that took us to El Capitan where we could watch the rock climbers work their way up the face of this impressive rock face. Mirror Lake, another delightful scenic hike, starts from the Ahwahnee Hotel, now called the Majestic Yosemite Hotel. This lake dries up seasonally so check conditions before hiking. Yosemite Falls and Bridal Veil Falls were impressive this time of year and the latter was spraying so much water we were soaked very quickly. We had planned to stay 4 nights at Wawona but since the pass was not clear to drive to Mono Lake for our last day, we left one day early, and the hotel refunded us in full for the last night, which was great! We then headed to Lake Tahoe for 3 nights where we stayed at the Best Western Station House, moderately priced and well located, I recommend it. We decided to dine at the Lew Mar Nel’s Steakhouse on premise, but were very disappointed. Food overpriced and mediocre. The next day was a glorious all day drive around the lake, stopping for numerous photo ops and short beach hikes and oyster and beer stops at quaint local places. Our second day was spent in Carson City, Nevada , the state capital, a 2 hour drive from our hotel. Named after Kit Carson, this town offers a wealth of activities for a one day visit. It had a superb train museum and an outstanding State Museum. Plan to spend an hour in the train museum and 2 hours in the State Museum. After that a must do place for lunch is Red’s Old 395 which offers great food and an astounding array of western artifacts, a great family place. If you still have energy after all this, you can visit the Capitol Building and some of the historic homes. We left Lake Tahoe for Point Reyes on the coast, a 4 hour drive through central California. Point Reyes is a remote windy spit of land jutting out into the Pacific. If you have the energy you can clamber down the steps to see the lighthouse and then clamber back up to visit the small Visitor’s Center. Bring binoculars to view the whales if it is the season. We saw a small pod! From there we drove less than an hour to the town of San Rafael, a cheaper alternative to San Francisco, where we stayed at the Villa Inn, moderate priced hotel, for the next 2 nights. The next day,Saturday, at the advice of our friends, we left our hotel super early so as to be at the entrance to Muir Woods by 8:00am. The drive at that time of morning was only 30 minutes so we arrived 7:45am and were the 4th car in the parking lot adjacent to the entrance. When we left the park around 10:30am, cars were parked along the road about 2 miles or more from the park! At that hour of the morning we had Muir Woods to ourselves. It was a bit chilly until the sun peeked through the trees and then it was magical. The local café opens around 9:00am with tasty coffee and breakfast options so we chowed down for a late breakfast. After that we drove an hour to the lovely town of Sonoma where we met up with friends for a late lunch, then back to San Rafael. Our last day was spent on Fisherman’s Wharf in San Francisco, dining on fresh calamari and Dungeness crab before heading to the airport for our evening flight home. We love historic train rides, as you can tell, so we decided to try the all day Cumbres & Toltec steam engine train ride that skirts the Colorado and New Mexico border. We started and ended in Antonito, Colorado, which is an easy 4 hour ride south of Denver, but you can also begin and end in Chama, NM. Chama is a much prettier and nicer town than Antonito. There is nothing appealing to the tourist in Antonito except for one thing: The Indiana Jones B & B, so that is where we stayed for one night. The third Indiana Jones movie was filmed here: “Indiana Jones and the Last Crusade” and Harrison Ford stayed here as well. The house looks exactly as it did in the movie, right down to the same color paint and the mailbox marked “Jones” out front. We sat in the living room and watched the movie and were delighted to see that we were seated in the exact same spot where one of the opening scenes was filmed, where a young Indiana Jones, bursts into his house and then was confronted by the “bad guys” who took away the antique cross he found. We also were able to see the older version of the Cumbres & Toltec Railroad that was used for the train scenes, especially the one with the snakes in the train car. The guest rooms in the B& B were recently remodeled and quite comfortable, but no twin beds, only queen in each room. If you call ahead, the owners might be able to set up a rollaway in one of the larger rooms. If you are a movie buff and like unusual experiences, this is the place for you. This 10 day celebration , usually held in the latter part of July,in Cheyenne, Wyoming, is the largest rodeo in the world! In addition there is Frontier Village, a sprawling recreation of a western town in the 1880’s plus the Native American village which features excellent Native dancing and booths of jewelry and handicrafts. This is the place to buy Cowboy boots and hats and belts and western gear, which we did. There is even a large boot store for used boots. Like those $350 decorated boots? Buy them gently used for $40!! Only 2 hours drive north from Denver, including the Frontier Days at Cheyenne, Wyoming is a great addition to your summer vacation. Arrive by 10:00am for best parking and to get a jump on the crowds. This is an all day event and you can come and go into the rodeo stadium as you please. I was invited, as a tour operator and travel writer, to join a one week inspection tour of this remote country which was the center of Marco Polo’s journeys across the Silk Roads. I could bring a companion. So I invited my son who joined me for 24 hours in Istanbul before we flew to Tashkent on August 1. Istanbul is an amazing lively city, and we found a great little hotel, Acadia Bleu, right in the heart of the historic district so we could walk everywhere. Our breakfast on the terrace upstairs had a full view of the Haga Sophia and we dined during the call to prayer. Awesome. My luggage got lost, never saw it again until a few days after I returned home. So our first day in Tashkent was spent clothes shopping. 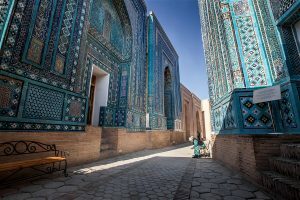 Besides the capital city of Tashkent we visited Bukhara and the fabled city of Samarkand. Uzbekistan is famous for its ancient history and its incredible architecture seen nowhere else in the world. We learned that there were many Silk Roads, not just one. We visited caravanserais, right by the main road, where the ancient camel caravans came to rest at night. The walls and entry gates are often still standing. The big surprise was how friendly and receptive the people were. Some speak English, but my son’s fluent Russian gained us a lot of friends. We stopped at a small farm town called Mitan where we were greeted by an extended family with warm hugs and kisses and then sat down for a feast from their gardens and farm including homemade port wine! The country is very safe, no robbery or violent crimes. It is quite safe to walk the streets at night. Food was good. Being a double landlocked country, meat was served with every dish: lamb, beef or chicken and soups were excellent. We usually had their sweet watermelon for dessert. Although it is an Islamic country, it is secular and the women dress in beautiful jewel colored long dresses, no two alike. The younger women often prefer western style clothing . A head scarf is more of a fashion accent than a religious statement. Uzbekistan is celebrating its 25th anniversary this year. It is still third world when it comes to banking and bathrooms outside the hotels, but they are working on it. You need to have a sense of adventure to travel to this unique and distant country, but I am glad I did. Last but not least, take a gander at the itinerary for this amazing family trip. You will be able to make peanut butter on a peanut farm, make chocolate from the cocoa beans and visit the amazing Tikal National Park, the New York City of the Mayan world. Guatemala is a colorful delightful country with a lovely climate, culture, and fun activities. Hope you can join us!